“One of the most famous films never released” and “one of Hollywood’s holy grails” is now getting a release. Aretha Franklin (1942-2018) may have been best known as the “Queen of Soul,” but she started her stunning career singing gospel music as a teenager on tour and at home in Detroit, where her father was a star pastor. Her 1972 album, Amazing Grace—an extraordinary concert of Franklin at the peak of her powers—was her most successful record, and the best-selling live gospel album of all time. It was recorded at the New Temple Missionary Baptist Church in L.A.’s Watts neighborhood—home to the gospel legend Reverend James Cleveland—by a team supervised by producer Jerry Wexler and in front of an audience filled with admirers, including Mick Jagger. 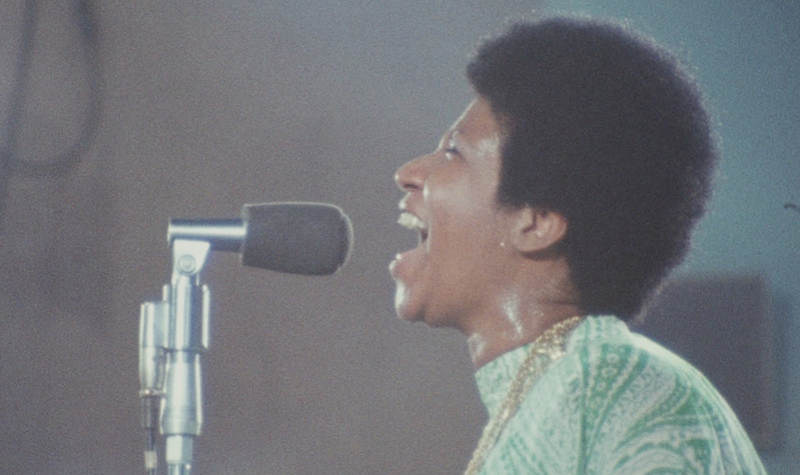 What is truly amazing is that this concert—a thrilling performance by Franklin in her prime—was also filmed by Oscar-winning director Sydney Pollack (OUT OF AFRICA, TOOTSIE), but has remained unseen and unfinished for 46 years. Now, audiences will finally see Franklin sing a mix of gospel standards and contemporary songs, including ”Never Grow Old,” Marvin Gaye’s “Wholy Holy,” “God Will Take Care of You,” Carole King’s “You’ve Got a Friend,” “How I Got Over,” the title track, and much more.